We were not sure if we were going to complete this project this week, class time seemed so short, and making gingerbread houses from scratch is difficult! We finally allowed ourselves to trim mix-matched pieces (just like in real construction projects) which helped. But there are parts to this that just can’t be rushed: you can’t put the entire house together and decorate it all at once. There was a jewel like moment when a group of students realized that they had eaten too much of the gingerbread dough a few days earlier, and had to race to make more in time to use for buildings. They got there with gusto even if the final houses didn’t look the way some had originally planned. Still, this was definitely worthwhile. By the last minutes on Friday, everyone was actively into the fray to finish the decorations. Several other classes stopped by afterwards to view, but I decided to forgo the judging in the final hour, not wanting to jeapordize the satisfaction in our accomplishments in presenting the houses. This already has me thinking of ways to make this an even better project (whether competing or not) for next time. Tiles, perhaps, to decorate and become a house of cards? I can recommend King Arthur Flour’s recipe if this is your first time. This version of gingerbread is more structural, and it tastes better as it ages, if you don’t mind the texture. It holds up pretty well. The icing is thin, but dries to concrete. 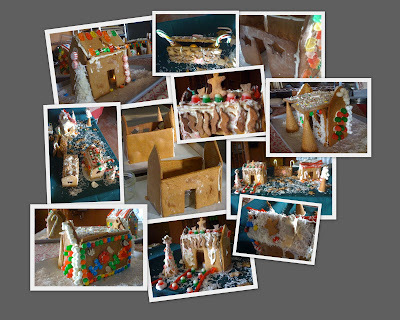 Some of the structures you see were made with 5 day old gingerbread and are still going strong. In fact, houses that were not taken home are still at school, covered, until after New Year’s. I’m curious how they will hold… Happy New Year to Everyone!